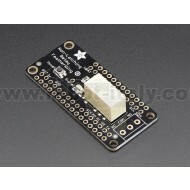 This is the Non-Latching Mini Relay FeatherWing. It gives you power to control, and control over power. Put simply, you can now turn on and off lamps, fans, solenoids, and other small appliances that run on up to 250VAC or DC power using any Feather board. A Feather board without ambition is a Feather board without FeatherWings! 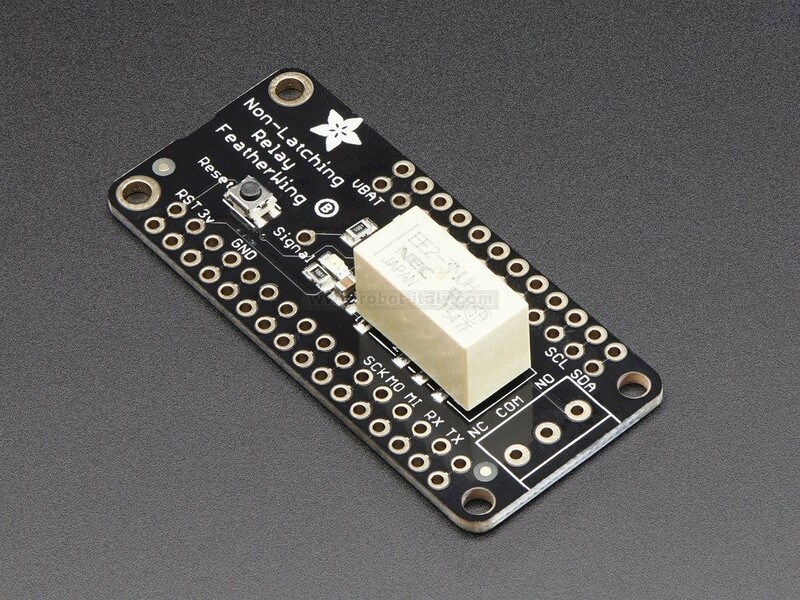 This is the Non-Latching Mini Relay FeatherWing. It gives you power to control, and control over power. Put simply, you can now turn on and off lamps, fans, solenoids, and other small appliances that run on up to 250VAC or DC power using any Feather board. Using our Feather Stacking Headers or Feather Female Headers you can connect a FeatherWing on top of your Feather board and let the board take flight. Check out our range of Feather boards here. The are two 'flavors' of these FeatherWings, this is the simple Non-Latching relay. This Wing has a single Set pin. 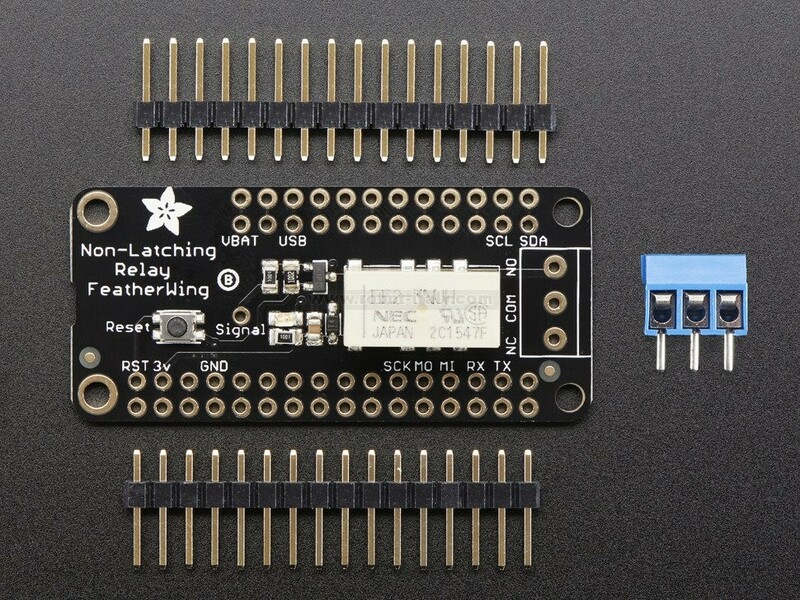 Normally, the relay's COM pin is connected mechanically to the NC pin and the NO pin is disconnected. When the relay is active, a red LED is lit, and about 50mA of current is used to keep the coil switched on. Note, if power is lost, the relay will go back 'open'. Now, you might be thinking "wow I really don't want to waste 50mA of current, that will really sink my battery life!". OK good news, we have another type of FeatherWing, the Latching FeatherWing. You need two pins but save power. Note, if power is lost, the relay will stay in the last setting. Both FeatherWings use the same family of relay. You can switch up to 2A of resistive current at 30VDC or ~40VAC or lower. At 110VDC you can switch up to 0.3A, at 120VAC up to 0.5A, and at 250VAC you can switch up to 0.6A. Check the datasheet for the relay for the exact switching capacity, and of course, for reactive/inductive loads you will need to derate. This isn't a relay you can use to turn on and off your washer/dryer, stick to 60W or less. 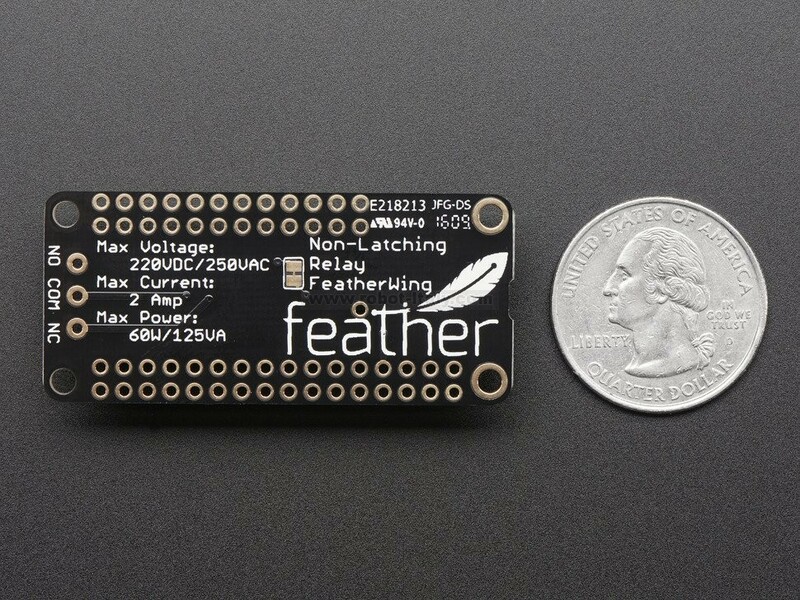 Each FeatherWing comes with a fully assembled and tested PCB, header you can use to attach to your Feather. You also get a 3-pin terminal block you can use to wire up whatever you are going to be relay-controlling. Some light soldering is required. Please note: If using with high voltages (> 24V) use care and common sense! High voltages require experience, and are only for use by engineers who are comfortable with guidelines and know how to use safely! 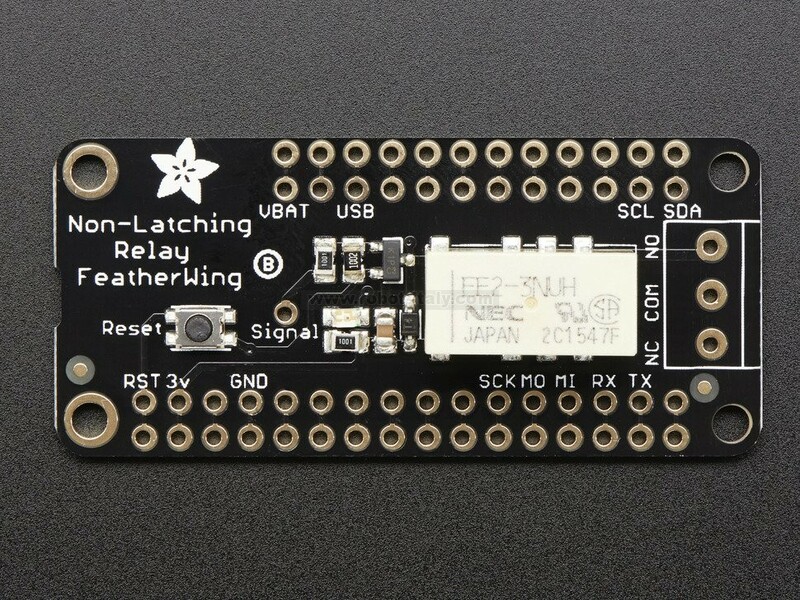 Our learn guide covers everything you need to know for the Non-Latching and the Latching Mini Relay FeatherWings! 50.8mm x 22.9mm x 11.4mm / 2" x 0.9" x 0.45"
These two Female Stacking Headers alone are, well, lonely. But pair them with any of our Feather boards and you're in business!